FIVE GUYS (& TWO GIRLS). | O. R. R. - Life & Style Journal. FIVE GUYS (& TWO GIRLS). Don't be scared, this post is totally rated G. Suitable for all ages. 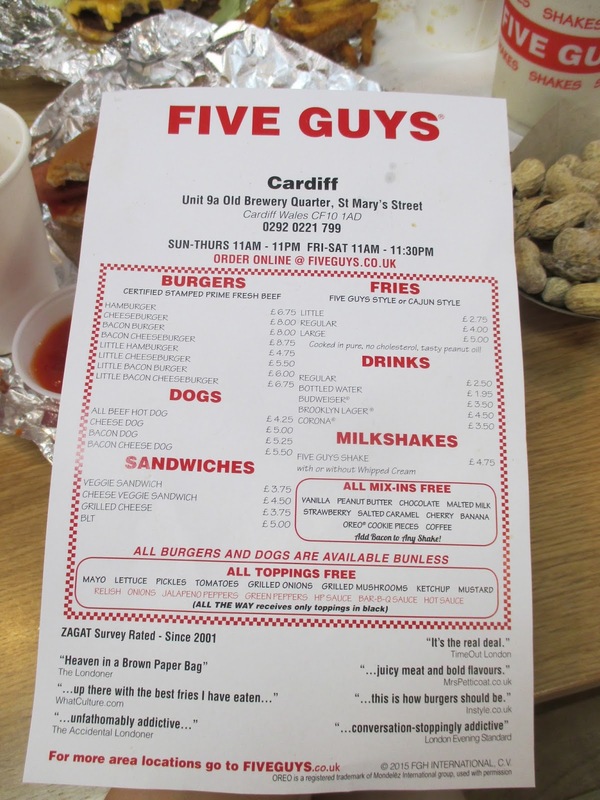 Charlotte & I were invited to visit and review the new Five Guys restaurant in Cardiff and on Wednesday we hopped on a train and headed down there. I'd been wanting to go to Five Guys for a while, mainly because almost everyone on my Instagram timeline kept posting photos of their meals at Five Guys and I'm the world's greatest foodie... so it's actually pretty cool that they now have a branch nearby. An hour away by train but still, that's much better than going all the way to Bristol, Reading, Nottingham or London. Below is a slideshow of the interior of the store and outside seating area at the back. They've also got seats for toddlers - not pictured. Charlotte and I managed to get a photo of five of the staff, thanks to Steven, the manager - pictured on the right in the last slide photo. He was extra nice and explained a lot about the Five Guys franchise to us. All the ingredients are fresh and are cooked in a clean environment. I love the little sign that says where the food is from! There are also boxes of peanuts, a.k.a groundnuts in the store. They taste almost as good as the roasted groundnuts in Nigeria, ha! Imagine my shock when Charlotte stated that she didn't know how to open a peanut... I had to teach her! Lucky for us, the Cardiff branch is one of the few ones that serve milkshakes, Charlotte and I both opted for banana, peanut butter and salted caramel milkshakes with whipped cream. The whipped cream was so nice and thick, almost like ice cream. The milkshake itself was even better. So amazing, for real. I'm lactose intolerant but I still eat dairy because I can't stop myself, sigh. That's how good it was, I didn't regret the tummy ache I had afterwards. It was worth it. On to the main meal, I had a bacon cheeseburger with lettuce, pickles, grilled mushrooms, jalapenos, peppers and hot sauce. I'm African, please. I like my food extra hot and spicy. Now that I think about it, I should have asked for mustard in my burger. After placing my burger order, the guy behind the till gave me a look and asked if I wanted spicy fries as well. I felt like we'd connected. I got a side of cajun fries. Charlotte had an all beef hot dog with mustard, ketchup and a side of normal Five Guys style fries. The toppings are all free, as are the milkshake mix-ins. You can mix things up however you want to. Look at all that cheese, much wow.. I usually don't finish burgers, sandwiches or most pastries; a problem I've had since I was a kid. What I do is eat half of the bun or exterior and then eat all of the middle bits but the buns at Five Guys were good. I was stuffed but I still devoured all of my food; peanuts, fries, burger and shake! I enjoyed my meal, totally worth the price. I'll definitely be back for more in the future when I feel like having an extra-cheeky cheat meal. I want to try the rest of the menu. Who knows, I might add bacon to my milkshake. Yes, for some weird reason that option exists. In case I missed out anything, check out Charlotte's review. 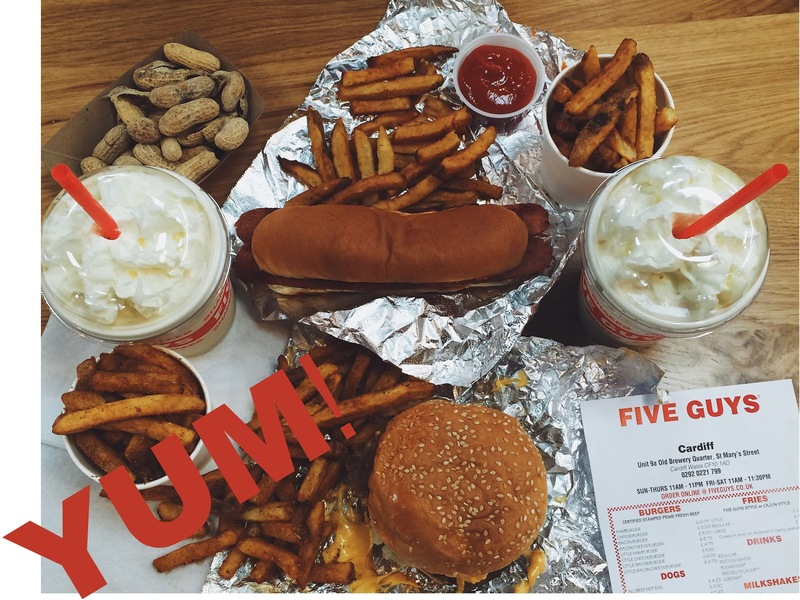 If you've got a peanut allergy, Five Guys is probably not for you. If you haven't then what are you waiting for? Find your nearest branch - UK / US / CANADA. Thanks to Five Guys for having us! Here's a photo of me looking extra grateful.